Irish medical cancer research charity to inspire and support research into cancer in Ireland. Investing in cancer research and supporting families affected by cancer across Ireland. Helping and supporting those families affected by Parkinson’s across Ireland. The Depaul Group started their work in 1989 in response to the growing number of homeless people on the streets of London and has since expanded to other countries. Depaul UK today focuses on young people in crisis. The Marie Keating Foundation team has walked both the French Way and the Portuguese Way, raising funds for their important cancer support services and awareness work. Their trek even featured in a RTE Documentary. The Mayo Roscommon Hospice team has trekked many Camino routes over the years, including the Portuguese Way and the French Way. The trekkers at World Vision Ireland have tackled the famous Camino Frances route and they have more fundraising adventures coming up, both on the Camino and in Ireland. Mainstay DRP provides care and support for families affected by learning disabilities in County Down. Their fundraising treks have taken them to the Camino Frances, Portuguese Way and Finisterre. The CMRF Crumlin team are also among our keenest adventurers, having trekked the Camino de Santiago and Sierra Nevada raising funds for Crumlin Childrens Hospital Dublin. The Camphill Communities team has walked both the French Way and the Portuguese Coastal Way, raising funds for their work with people with intellectual disabilities. The team at Southern Area Hospice from Northern Ireland are Camino experts at this stage, having walked many sections of the Camino de Santiago: across the Pyrenees, La Rioja, the Meseta and in Galicia. The Southern Area Hospice Camino fundraising trek helps the organisation raise funds to support patients with life limiting illnesses. The team at Peter McVerry Trust are keen trekkers and have hiked Tour du Mont Blanc a few times. Their work focuses on reducing homelessness and social disadvantage in Dublin’s inner city. 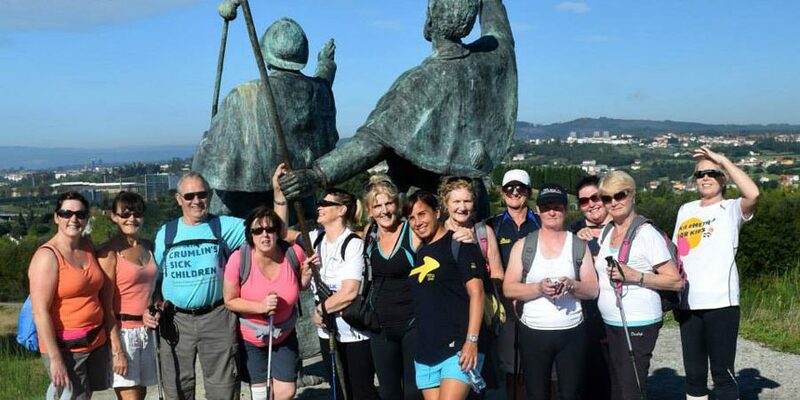 Diabetes Ireland, the charity helping people living with diabetes, has taken to the Camino a few times, including the Portuguese and Portuguese Coastal routes. MS Society Ireland, the Multiple Sclerosis charity has trekked a few Camino de Santiago routes, including the Portuguese and French Way. The Simon Community team works to prevent homelessness in Ireland since 1969. They have walked the Camino Frances to Santiago several times. The team of St James Hospital, a teaching hospital in Dublin city, has also hiked their namesake Way of St James as part of their fundraising activities. Wendy McMahon from the UK walked the Camino in memory of her husband Glenn and to raise funds for the foundation named after him: the Glenn McMahon Foundation. Development agency Self Help Africa supports communities across rural Africa to eradicate hunger and poverty. The Cappagh Hospital Foundation fundraising treks contribute to improve patient care as well as research, development and education at Dublin’s orthopedic hospital. Based in Scotland, the Michelle Henderson Cervical Cancer Trust is a small charity supporting women affected by cervical cancer. The Beaumont Hospital Foundation raises funds to constantly improve services for patients at Beaumont Hospital in North Dublin. My Aware have been working for 40 years to help people in the UK living with myasthenia, a sever muscle disease. Foyle Hospice provides care for cancer patients in the Derry/Londonderry area, in Northern Ireland. The Teenline Ireland team works to improve the well being of young people going through difficult times across Ireland. The Sophia Housing team trekked the Via Francigena across Tuscany to raise funds for their housing programmes across Ireland. CRY is an Irish charity supporting families affected by the loss of a loved one by sudden cardiac death. The team has trekked the Camino many times. BCNA is a network of 288 member groups supporting and empowering Australians affected by breast cancer. The National Breast Cancer Foundation Australia funds breast cancer research, the most common cancer facing Australian women. They have walked the Camino Frances from Sarria. Team Manuela raises funds to raise awareness and prevent sexual crime in Ireland. The foundation honours the memory of Swiss student Manuela Riedo. They’ve been part of the Cawley Camino twice and have organised a fundraising trek on the Coastal Camino Portugues. Breast Cancer Foundation New Zealand has a vision: zero deaths from breast cancer. To achieve this they promote breast awareness and early detection. they have walked the Camino Frances from Sarria. Ross Helping Hands is a non profit company assisting local cancer patients and their families in the East London area. They have walked to Santiago from Sarria on the Camino Frances. Cure Brain Cancer Foundation focuses on brain cancer research and awareness in Australia and has a mission to increase survival rates by 2023. They’ve walked the Camino Portugues from Tui to raise funds. Since 1985, Aware has been supporting people affected by depression, bipolar disorder and other mental health disorders in Ireland. They’ve walked the Camino Frances from Sarria. The team at Cancer Focus Northern Ireland work to reduce the impact of cancer on people’s lives since 1969. They climbed Kilimanjaro with us in 2017.